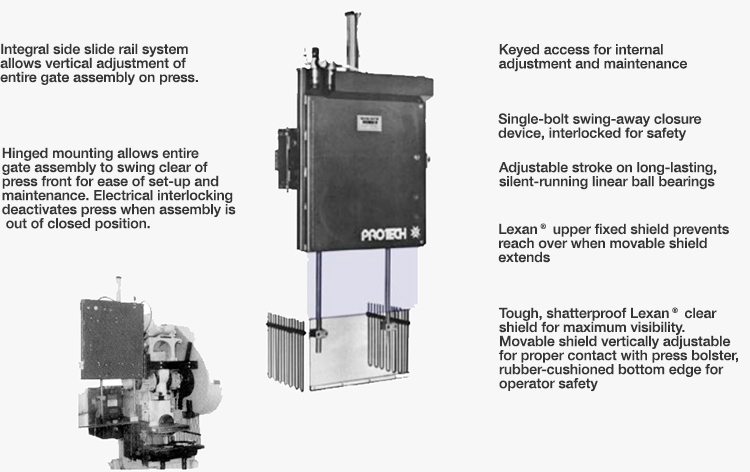 The PROTECH Series 12 PRO-TECH-TOR provides point of operation protection for operators of straight-side and open-back power presses. When used in compliance with OSHA 1910.217 regulations for “Type A” gate guards, installation of the PRO-TECH-TOR is permitted on both full and part revolution presses and the device provides superior operator protection in all modes of operation.. 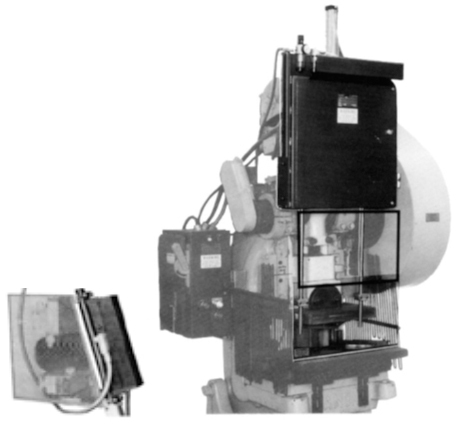 The PRO-TECH-TOR’s clear front shield automatically encloses the point of operation on actuation of the press tripping control before allowing engagement of the press clutch. Should the downward closure of the shield be interrupted at any point, tripping of the press will be prevented. The shield remains closed through the duration of the press stroke and rises only when press slide motion has ceased at top stop. If, for any reason, the press should “double trip” or run past top stop in the singlestroke mode, the shield will remain down to guard the point of operation. In continuous mode operations, the gate remains closed during the entire period of press cycling. PROTECH’s PRO-TECH-TOR has been designed for the production environment –– rugged, reliable and rapid. The PRO-TECH-TOR has excelled in secondary press operations, where profitability is dependent on operator efficiency. Years of trouble-free operation have proven the design, and the unique swing-away mounting for ease in press maintenance and set-up has made the PRO-TECHTOR a favorite in shops where quick tooling changes are mandatory. Extremely rapid operation that will not impede production, yet the shield operates on air/gravity closure so light that no hazard is created. Few moving parts and no complex mechanisms make for easy installation and low maintenance –– only four wires for electrical interface and one air feed connection. Exclusive self-checking circuitry and quality materials are combined to assure a high degree of reliability; every unit is factory-tested before shipment. Automatic movable gate guarding devices work well on many automatic applications, flat piece parts fed under the guard secondary operations inserted wholly inside the guard area. If there are flanges on larger parts extending beyond the guarded area, it may be necessary to put slots in the guard itself. This requires the slots to line up with all successive parts as well. The safe use of this dependent upon good maintenance, proper adjustment for each set up and part alignment if flanged parts are made. The shield provides significant protection to operators if there is a potential for catastrophic failure or dies. Includes pneumatic controlling equipment to insure long life;air filter, regulator and lubricator. Optional steel “hairpin” side guards; clear Lexan® available, too. And a full line of electrical and electro-pneumatic modifications for improved press safety and productivity.